Tooth fractures are a common form of dental problems caused by either injury or general wear and tear. In either case, they can be quite unpleasant and lead to further problems if left untreated. In severe cases, tooth extraction may be necessary to prevent problems from spreading and to protect the health and integrity of the neighboring teeth and surrounding gum tissue. A cracked tooth can announce itself in a variety of ways. The patient may experience pain when chewing or when biting pressure is released. The tooth fracture can also produce sensitivity to heat and/or cold. The symptoms may come and go, which can make diagnosis more challenging, but in all likelihood will become constant eventually. Tooth fractures produce pain because the pieces of a cracked tooth shift around and no longer protect the pulp inside. The pulp is soft tissue underneath the outer layer of hard enamel and the hard layer called the dentin under that. The pulp contains blood vessels and the nerves that register the pain. Naturally, this exposure and irritation of the pulp is quite likely to happen when a person is chewing or when biting pressure is released. Eventually, the pulp sustains enough damage that it can no longer heal itself and hurts all the time. It may even become infected and spread that infection to nearby gum tissue and bone. Along with the increasing discomfort, this prospect is one reason a patient experiencing signs of a cracked tooth should see an endodontist as soon as possible. The endodontist will determine the precise nature of the problem and the recommended treatment. Craze lines are a relatively benign form of tooth cracks generally found in adult teeth. They’re superficial, barely noticeable cracks that only go as deep as the outer enamel. Because they’re so shallow, it’s unusual for them to pose much of a problem. Chipped teeth are the most common kind of dental injuries. 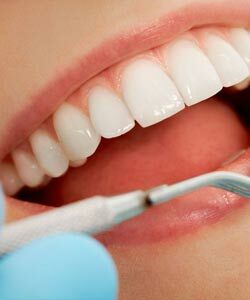 Dentists repair them by putting a tooth-colored filling or crown in its place. The cusp is the ridge on a molar tooth. When a cusp becomes weak, it can fracture, at which point it may break off or a dentist may see fit to remove it. If the fractured cusp has resulted in damage to the pulp, a root canal and a full crown could conceivably be indicated. If the crack in a fractured tooth runs from the chewing surface to the root, this too can damage the pulp and possibly require a root canal. If the cracked tooth does not receive treatment, it may even need to be extracted. A cracked tooth can also become a split tooth. The patient often loses a split tooth or at least a portion of it. Saving the tooth requires endodontic intervention and a restoration. A vertical root fracture is one in which the tooth fracture starts in the root and then spreads to the chewing surface. Unfortunately, it’s not uncommon for this type of fracture to go undetected until the tooth requires a relatively elaborate corrective intervention or possibly even extraction. Whatever the precise nature of the problem, the dentist will choose the most appropriate treatment from a number of possible options. A filling is appropriate if the crack is minor and may be all that is necessary unless the crack continues to grow. Dental bonding binds the fractured parts of the fractured tooth together or binds a replacement part in place. A white filling material serves as the bonding agent. This technique commonly works well when the dentist is repairing a tooth with a minor chip. Worn while the patient sleeps, mouthguards can prevent cracks and reduce symptoms of tooth fractures. As another means of protection, dentists often use crowns when a crack is deemed significant. By covering the fractured tooth, the crown prevents further cracking. When cracks reach the pulp, they can compromise the nerve and produce severe pain. At that point, a root canal is the recommended procedure. A root canal ends the distress by cleansing, removing the nerve, filling the pulp and putting a crown on the tooth afterward. Extraction is clearly the most radical procedure, but it is occasionally necessary if nothing to be done to save the fractured tooth, as is often the case with a vertical fracture. Once the cracked tooth has been removed, it is possible to put a bridge, implant, or partial denture in its place. Unfortunately, tooth fractures aren’t like bone fractures. They don’t truly heal. For this reason, no one can guarantee that problems won’t recur. A crown shields the damage to the tooth underneath it, but it’s possible a crack will continue to spread and separate even so. Eventually, the individual might even lose the tooth. But in most cases that won’t happen overnight. Patients who seek treatment for tooth fractures can confidently look forward to years of trouble-free chewing thereafter. Of course, in an ideal world, an individual would never experience tooth fractures in the first place, and although it’s impossible to guarantee that, there are some things people can do to improve their odds, like wearing a nightguard if you clench or grind your teeth. To get answers to your questions about treating tooth fractures and how you can take better care of your teeth and gums, contact us today.